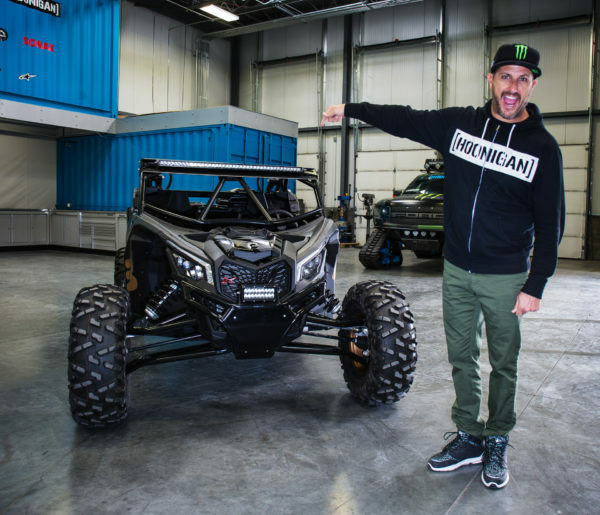 The bad to the bone Maverick X3 has been turning heads since it made its debut, but this custom build from the Hoonigan himself, Ken Block might be our favorite one yet. The Maverick X3 MAX four seater is built to be street legal in Utah and is complete with bike rack for mountain bike transport. Ken calls it the “ultimate Park City summer fun machine”. The vehicle is bolstered with a bigger turbo, black and gold graphics, new cage, and a handbrake. Ken said he always dreamt of adding a fully-custom, rally-style hydraulic handbrake setup to a side-by-side and the crew from S3 Powersports made it happen.